There’s a temperature pattern in the Pacific Ocean that causes warming and cooling every 20-30 years. The Pacific Decadal Oscillation shifts heat around the globe, but the Earth is steadily warming overall. 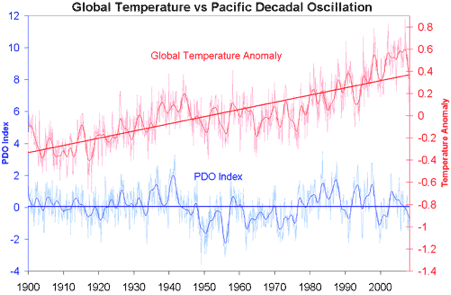 The Pacific Decadal Oscillation (PDO) is a climate phenomenon that occurs primarily in the North Pacific Ocean. The “oscillation” happens between warm phases (positive values) and cool phases (negative values) that last anywhere from 10 to 40 years. The warm and cold phases are associated with changes in sea surface temperatures (SST). While the causes of the PDO are still unknown, the primary effects seem to be changes in northeast Pacific marine ecosystems and a changing jet stream path. It’s important to note, however, that the phases are not set in stone; there are frequently short sets of 1-5 warm years during a cool phase and vice-versa. Secondly, the “warm” and “cool” phases are less descriptive than they would appear. The cool period, for instance, is actually associated with extremely high sea surface temperatures in the Northern Pacific (Figure 1). Figure 1: PDO warm phase (left) and cool phase (right). Image courtesy of JISAO. One way to test whether the PDO is causing climate change is to plot the Global Temperature Anomaly alongside the PDO Index (shown below). What we find is that although the PDO index appears to influence short-term temperature changes, global temperatures have a distinct upward trend, while the PDO Index does not. Figure 2: Pacific Decadal Oscillation index (blue, University of Washington) versus Global Temperature Anomaly (red, NASA-GISS). Smoothed data (thicker blue and red lines) and trend lines (thick straight line) are added. © John Cook. Natural oscillations like PDO simply move heat around from oceans to air and vice-versa. They don't have the ability to either create or retain heat; therefore, they're not capable of causing a long-term warming trend, just short-term temperature variations. Basically they're an example of internal variability, not an external radiative forcing. If PDO were responsible for warming the surface, the oceans would be cooling, which is not the case. These results are expected. The long-term warming trend is a result of an energy imbalance caused primarily by an increase of greenhouse gases in the atmosphere. In contrast, the PDO is an internal process and does not increase or decrease the total energy in the climate system.